Brian Coli, owner of Georgio’s Chicago Pizzeria & Pub, teaches his son Cameron the pizzamaking techniques he and his father learned before launching their own pizza restaurants. Tour local merchants are magicians. Making a living in small business requires one to see what isn’t there as often as what is. A merchant’s life is full of surprises. Pulling a rabbit out of a hat, or making something out of nothing, is business as usual. Starting a business or purchasing an existing retail shop or restaurant, one expects to work hard. But one’s daydreams linger on thoughts of a time when customers are regular and the cash register (or iPad) rings up income that exceeds expenses. For many, the reality includes long hours, low pay and few days off for vacation or illness. Yet, entrepreneurs are still opening up new businesses every day. Why small business? Independence, freedom and creativity abound for the entrepreneurial type. Successful entrepreneurs often have several positive attributes. • A Business Plan. Marvin’s Toy Store, in Crystal Lake and Woodstock, is approaching its fifth anniversary thanks to owner Lori McConville’s dedication to a comprehensive plan. Her plan included strategies for marketing, location, expansion, audience, product and competitive evaluation. • A Story. Georgio’s Chicago Pizzeria & Pub, in Crystal Lake and South Barrington, has a great story. Brian Coli founded the business in 2003, but the pizza recipe was developed in the 1940s by two sisters who worked for Pizzeria Uno. The sisters shared their recipe with Michael Coli for his pizza business in the 1980s. Michael’s son, Brian, learned from the sisters with his father. 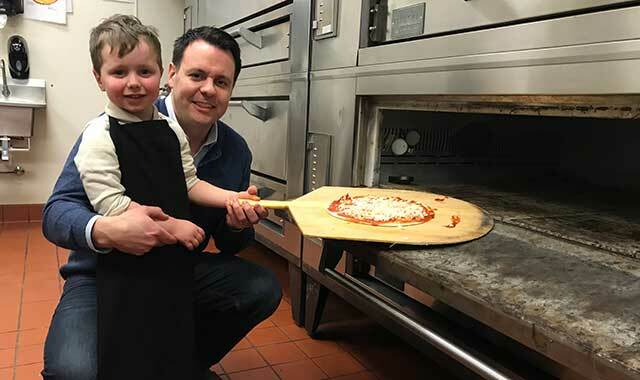 Now Brian is teaching his son, age 3, to love pizza making. Their story lives on. • Networks. Chambers of Commerce, Downtown Main Street, economic development groups and other networks provide support for small-business owners. Learn from each other, promote one another, and build a business community that grows and thrives. Most groups have small annual fees and marketing programs that can enhance local outreach. • Mentors. Finding a mentor to provide guidance can help keep business afloat in difficult times. Arlene Lynes, owner of Read Between the Lynes, in Woodstock, faced challenges with her location after nine years in business. She was approached by another retailer on the Woodstock Square, a mentor who encouraged Arlene to move into a larger space. By combining with the Woodstock Visitors Center, Read Between the Lynes has developed greater traffic, more sales volume and deeper roots. Local businesses bring back more than expected to the local economy. According to the Andersonville Study of Retail 2018, for every $100 you spend at an entrepreneurial local business, $68 stays in your community. National chains return only $43 per $100 to the local economy. Local businesses provide jobs, save fuel, and build infrastructure as retail tax dollars stay in your town to pay for police, fire and even flowerboxes. Local businesses foster community. It’s about people doing business with people who love what they do and have a passion to share, as they in turn nurture their community. Trust, friendships, goodwill and shared goals build a neighborhood of caring individuals who strive to create an economic engine that will thrive for many years. Do you have a brilliant entrepreneurial idea? Make a little magic, and start today!